Police shot dead two Uighur men and wounded a third Monday after they attacked officers who broke up a street fight, a week after deadly ethnic riots erupted in this western Chinese city. The police were attacked after they stopped the three from assaulting a fourth Uighur with knives and rods, said an official in Urumqi city who gave only his surname, Fan. The incident, which broke a relative calm in Urumqi - where ethnic unrest left more than 180 people dead and another 1,680 wounded - was the first time officials have said police opened fire on anyone. "The police fired into the air as a warning, but that did not stop the attack. The police then shot them according to law," Fan said. He said the wounded man was taken to hospital. His condition was not known. The shootings played out in front of frightened residents near one of the city's main Uighur neighborhoods. Photos taken at the time show one policeman raising his rifle to strike a man. Beaten, the man in a blue shirt with blood on his right leg lay on the ground. Police formed a ring around him, pointing their guns up at surrounding buildings. One witness, Zhang Ming, a construction worker at a building site near the incident, said he saw three men with knives come out of a mosque and attack a group of paramilitary police standing in a cluster along the road. Riot police then chased them, beat them and fired shots, he said. A few hours later a large splotch of blood smudged the street. Squads of helmeted riot police took up positions on the road, which was closed to traffic. 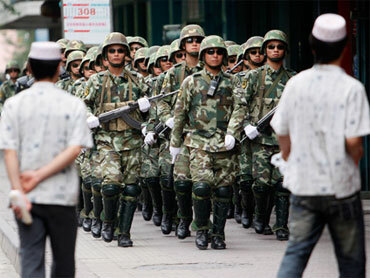 The incident came as authorities try to impose a sense of normality on Urumqi after the July 5 riots. The death toll in China's worst ethnic violence in decades could rise as 74 of the more than 900 people still in hospitals have life-threatening wounds, the official Xinhua News Agency said. Earlier Monday, security vehicles previously deployed on People's Square were no longer there but helmeted riot police remained in the area. Small groups of paramilitary police with riot shields stood guard on street corners and helicopters flew over the city. The violence began when Uighurs (pronounced WEE-gers) who were protesting the deaths of Uighur factory workers in a brawl in southern China clashed with police in Urumqi. Crowds scattered throughout the city, attacking ethnic Han Chinese and burning cars. Of the dead, the government has said 137 Han Chinese and 46 Uighurs died, with one minority Hui Muslim also killed. Uighurs say they believe many more from their ethnic group died in the government crackdown. Since last week, tens of thousands of Chinese troops have poured into Urumqi (pronounced uh-ROOM-chee) and other parts of Xinjiang to impose order. A senior Communist Party official vowed to execute those guilty of murder in the rioting.